Italian restaurant at home. Only one New York City restaurant can claim to be Frank Sinatra’s favorite: Patsy’s Italian restaurant on West 56th Street, featuring Neapolitan cuisine. Five lucky winners will win the cookbook from the restaurant, to cook the cuisine that Sinatra loved. 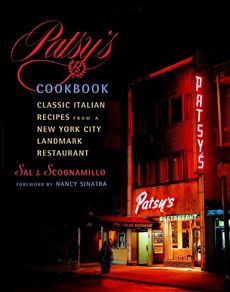 Patsy’s Cookbook: Classic Italian Recipes From A New York City Landmark Restaurant, by Salvatore Scognamillo, presents 100 recipes from the classic southern Italian cuisine that’s become American comfort food. Plan a buffet dinner of Mussels Arreganata, Fettuccine Alfredo, Rigatoni Sorrentino, Chicken Parmigiana, Veal Marsala and Shrimp Scampi, with Tiramisù for dessert. Directions for the 100 recipes are simple and well adapted to home cooking; the book will please both old and new fans alike. To Enter This Gourmet Giveaway: Go to the box at the bottom of our Italian Cookbooks Page and click to enter your email address for the prize drawing. Approximate Retail Value Of Prize: $27.50. This contest closes on Monday, January 17th at noon, Eastern Time. Good luck!